Afghan security forces have been fighting to gain control of a luxury hotel in Kabul after it was stormed by militants who killed several people. The gunmen burst into the Intercontinental Hotel on Saturday evening, shooting at guests and staff. Two of the attackers have been killed and the others remained holed up in the upper floors, officials say. At least five civilians have been killed and six are injured, an interior ministry spokesman said on Sunday. The attack began at about 21:00 local time (16:30 GMT), with reports suggesting the gunmen shot at security guards and detonated grenades as they made their way into the six-storey building. They targeted staff and guests before special forces were called in. Security forces have cleared most of the hotel and are now battling to secure the top floor and rescue any people trapped inside, the interior ministry spokesman said. More than 100 guests have been rescued from the hotel so far, he added. Some reports said the hotel had been hosting an IT conference attended by provincial officials at the time. One witness told Reuters news agency that the attackers had taken hostages. 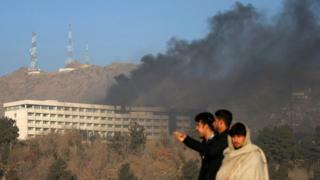 The attack comes just days after the US embassy in Kabul issued a warning about hotels in the city. “We are aware of reports that extremist groups may be planning an attack against hotels in Kabul,” the embassy wrote in a public security alert published Thursday, though it highlighted another hotel near the international airport as a possible target. On Saturday, a guest at the hotel told AFP news agency that people were hiding in their rooms. “I don’t know if the attackers are inside the hotel but I can hear gunfire,” the guest said. Another interior ministry spokesman told AFP an investigation had begun into how the attackers had breached security, which was handed over to a private company two weeks ago. “They probably used a back door in the kitchen to enter,” he said. The Intercontinental is a state-owned hotel which often hosts weddings, conferences and political gatherings. It was attacked by the Taliban in 2011. Twenty-one people were killed including nine attackers.